nyphonejacks: PoE injectors, PAP2T, 8 port switch and 2 surge protectors. PoE injectors, PAP2T, 8 port switch and 2 surge protectors. The 66 block and wiring coming out of the ceiling was already in place. The 24 port patch panel was already in place. The blue Netgear switch was already in place. 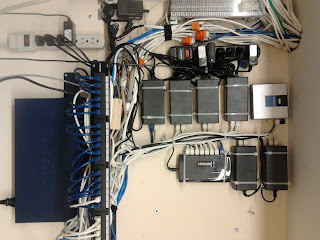 all of the blue patch cords from the 24 port panel to the switch was already in place. The phone wiring was run with CAT5 wiring and punched into the 66 block. I converted 4 phone jacks into data jacks for VoIP phones. The wiring was not long enough so I added keystone jacks and 8p8c (RJ45) connectors to extend the wire into the patch panel (the orange jacks to the left of the photo). I installed and mounted the 2 surge protectors (black one on top, and white one on bottom. I provisioned, installed and mounted a Linksys PAP2T to provide an extension for the overhead paging system (gray box towards top of image. I installed an 8 port switch (above patch panel to right). These power Polycom 331 phones that were installed in various locations within the store. I installed all of the white patch cords from the 24 port panel to the PoE injectors and switch. All of the existing wiring that went to the old phone system that was removed before I arrived were taped back and placed above the panel. They were just hanging down and messy. Still need to test overhead paging system. Currently it remains in an ROH state as soon as dial tone is connected to it. I believe that the telephone interface is defective and may need to be replaced. . I also need to add several ATA devices for several cordless phones. Currently there are 2 Linksys 3102 devices in place for 2 cordless phones, however they need to be replaced with PAP2T or 2102 devices. There is only 1 free port left in the Netgear switch, and 1 port available in a Linksys/Cisco wifi router that was already in place to the right of the panel. Is PEO Networking is complicated??? Host your own proxy for free on Google. What kind of crappy VoIP service does Ebay use?